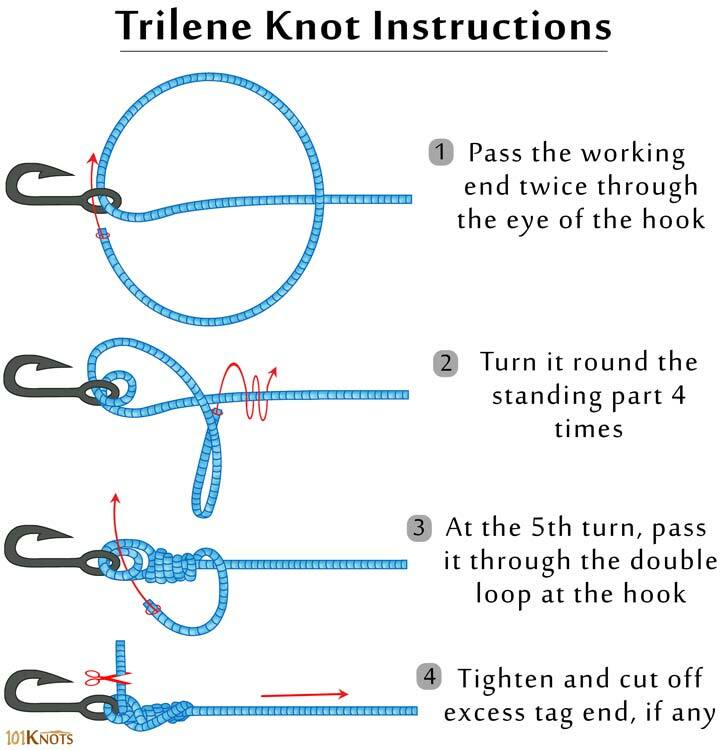 The Trilene knot is a powerful and reliable fishing knot that is effective in tying a monofilament or fluorocarbon line to swivels, hooks, snaps and lures. It is known to retain about 85-90% of the line’s original strength. The retention capacity goes up even more when the diameter of the eye is greater than that of the line. It was researched and developed by the Berkley tackle company and is recommended by them to tie their monofilament. For security reasons, leave about 1/8th of an inch when trimming the tag end. You may moisten the knot for allowing it to be pulled tightly in the last step. Improved clinch knot – A weaker substitute, it gives the initial double knot a miss and employs an extra tuck under the final turn. Clinch knot – Even weaker, basically used for fly to tippet connections. Uni knot – Easy to tie and dependable for joining monofilament to terminal tackle. Palomar knot – Very strong suitable for fluoro, mono and braided lines. Nanofil knot – Basically a double Palomar knot.